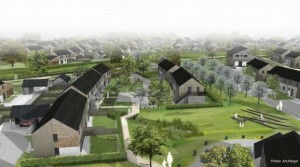 Is this the U.K.’s greenest housing estate, this vision of snug, low energy Passivhaus life in the country? 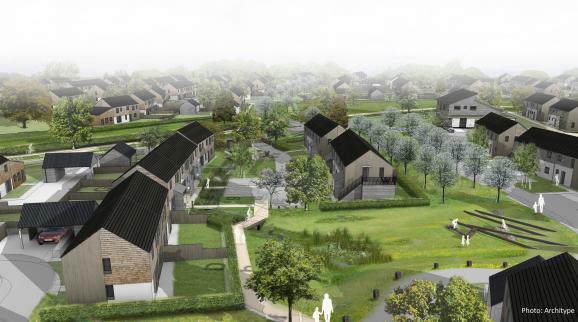 What is believed to be the largest Passivhaus development to date has been given the go-ahead. Councillors on Herefordshire Council voted in favour of the estate of 150 houses, on a 20-acre site in the village of Kingstone earlier this month (June, 2013). It is expected to be one of the most energy-efficient estates in the country. The homes will be built to the international Passivhaus standard, with high levels of insulation and draught exclusion. They should require very little heating. It is said that houses of this type can be kept warm by the heat given off by a TV or hairdryer. And yet the developers believe they can build the properties for the same cost as standard homes. The council’s planners described it as: “An innovative proposal that is a radical and positive departure from conventional modern housing developments”. In the UK our homes and the energy we use to heat, light and run them, represents around 27% of the UK’s total carbon (CO2) emissions. The UK Government wants all new homes to be zero carbon from 2016. Passivhaus is a design concept for ultra low-energy buildings, promoted by the Passivhaus Institut in Darmstadt, Germany. Typically Passivhaus homes incorporate very high, “tea cosy” levels of insulation, heat recovery and airtightness, through triple glazed windows and well-insulated doors, and walls. Other details include the buildings’ shape and orientation. The Passivhaus is designed to be a perfectly comfortable place to live, summer and winter, requiring little or no heating or cooling – roughly 10 times less heating (compared with conventional houses), returning big reductions in energy costs Proponents want to show the doubters that Passivhaus-certified homes are not intended for committed environmentalists, prepared to pay a premium. There are more than 12,500 Passivhaus buildings worldwide, most of them in Germany and Austria. Homes built to the Passivhaus standard require roughly 10 times less heating (compared with conventional houses), returning big reductions in energy costs. The principles of Passivhaus address such detail as the buildings’ shape and orientation. The practice has joined forces with Swedish businessman Lars Carlsson to set up a new development arm, Archihaus, to take forward the project. However local people voted 63 to 2 against the proposal at a parish council meeting. A local newspaper account made no mention that all of Passivhaus, or the big energy savings to be expected from the scheme. This suggests that supporters of the concept still have a lot of work to do to both inform the public about its basic premises, and persuade them to back it. Archetype wants people, even if they understand what can seem to many a rather abstruse architectural concept (and the rather forbidding Germanic name doesn’t help), to stop thinking of Passivhaus as “an unaffordable extra’”. Director Jonathan Hines said: “This scheme will establish a new benchmark in housing development, by demonstrating that better design quality and Passivhaus can be achieved as standard”. The spin-off ArchiHaus was formed to develop sustainable housing and establish a factory in Herefordshire to build the components for the Kingstone development. This approach could “achieve higher standards at a competitive cost, achieving high standards at a cost that is competitive”, Hines said. Drawing inspiration from both Passivhaus principles and the local Herefordshire vernacular, the house plans are shallower in depth and have a wider frontage than typical volume house-builder homes. The builders intend to use locally sourced material as much as possible, favouring organic materials and lime, which sequester carbon, to bring down the embodied carbon per square metre figure. Archetype said it intends to show how it can “transform the quality and the sustainability of developer housing in the UK”.